Finally, a community that understands and celebrates the active senior. Located just 30 minutes from Asheville, NC. Come visit us today--your new home away from home in the heart of the beautiful Blue Ridge Mountains. We actually stayed at this RV park 4 times, starting in April of 2018. 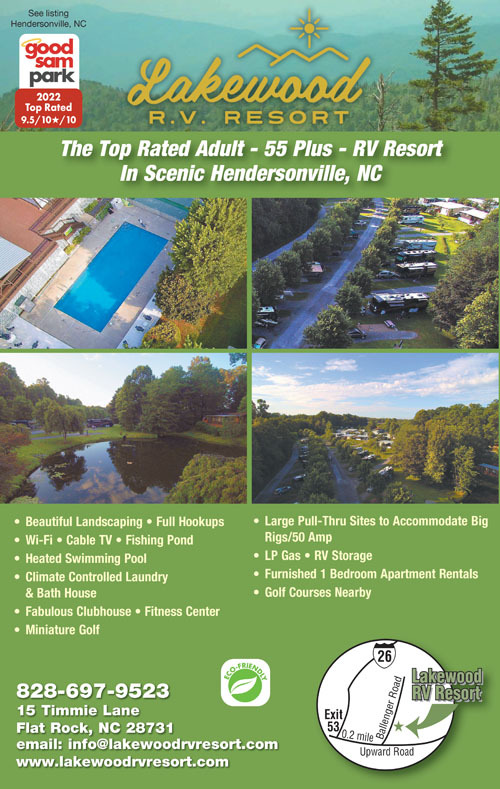 Finding good RV parks in NC for a big class A is difficult. This park is pretty and has very nice curb appeal. You will get the impression you are being watched from the moment you check in. The owners will insist on escorting you to your site even if you are an acknowledged repeat visitor. You must make sure none of your tires from your rig or your toad touch their grass not even an inch. You will get a visit asking that you realign your rig. (I stress the inches measurement here.) If it rains, your rig may not align to the concrete patio and your entrance door may protrude beyond the patio. The ground in the NC mountains turns to mud if there is run off. If you put a mat down by your exit door the owners send the grounds person to remove it. Ours was pulled up 3 times and thrown onto the concrete patio. It was torn at the grommets where it was anchored. Our dog would not exit the motorhome into the mud to take a walk. When cooking meals, the grounds keepers will perform their tasks around the clock while being indifferent to your activities as a guest. (The workers are residents from the retirement community.) We experienced having Round-up sprayed in our gravel and around our patio while we were cooking. Basically, the model of this park is for the owners to fund the fledgling retirement community they are building by having an RV park and renting spaces. Their main goal is to keep the retirement community happy. If you have a complaint about the deluge of home owners bringing their pets to defecate on the RV sites it falls on deaf ears. This RV park is pretty. However, you need a strong backbone. The pool is very nice and clean. Wi-Fi is not strong or consistent. I used my i-phone as my broadband. We thoroughly enjoyed our stay at this campground. The owner and staff were welcoming. The facilities are first class, and the sites are roomy and well laid-out. Although we didn’t take advantage, the park offers a daily calendar of park events, which was impressive. Perhaps best of all was the mild North Carolina summer weather, which made outside activities a pleasure. We look forward to coming back! We stayed here one night traveling thru. 43' with a toad and entrance was not a problem. Park was a little tight but manageable. Set up closer to the concrete pad to give you enough room for driver side slides. Watch the trees for clearance nothing that can't be managed just pay attention. When we made the reservations they didn't tell us the office was closed on Sunday so we had to find the site on our own. Not a problem but a little surprising. We asked for a pull thru as we didn't want to unhook for the few hours we would be there. The assigned site worked and we only used power. Cable was ok but couldn't log on to WiFi. Didn't get a chance to check out the facilities but will come back when we have more time. 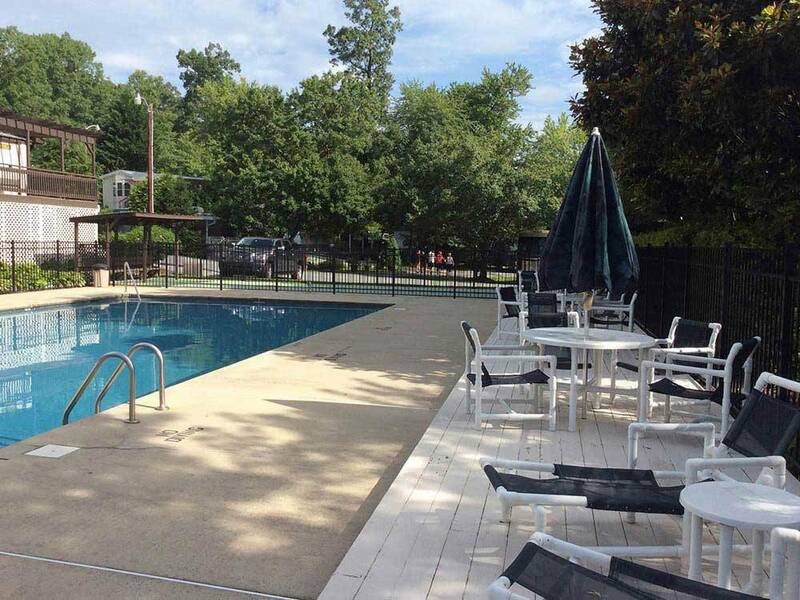 Nicely maintained RV park inside a neat, clean mobile home park for retirees. We arrived on a Sunday and the office was closed but we were able to get a reservation over the phone. Wifi worked well. Bathrooms were very nice.